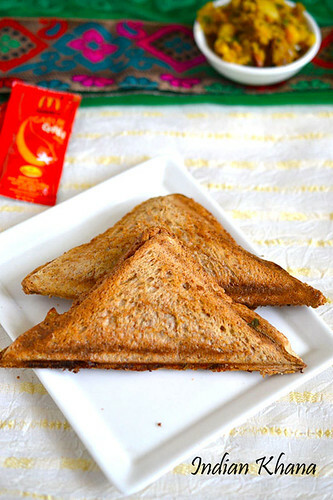 Aloo Masala Sandwich Toast or Aloo grilled sandwich is easy sandwich recipe a bit long in making but it's totally worth all the time spend for preparing masala or filling and we can also use the same filling to make paratha or also can use as a sabzi for roti or even filling for dosa so see how versatile this aloo masala is we can make in large quantity make sandwich for breakfast and aloo paratha or masala dosa for dinner. 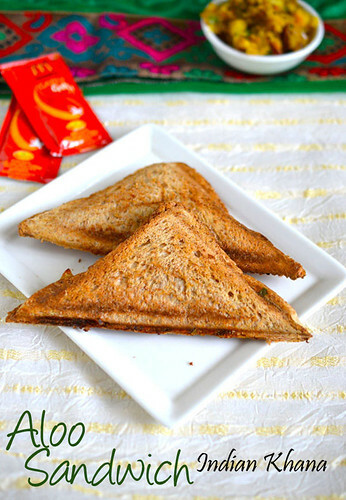 I make aloo sandwich in many way and this recipe is my SIL recipe she made this sandwich for breakfast couple of weeks back and I was busy doing something else so didn't manage to take step wise pictures but she was so sweet to make extra for me to take pictures for blog so I did took final pictures so share with you all this wonderful and tasty sandwich recipe. As I already mention it's take little long to make the filling as we have to boil potatoes then fry it along with onion and spices but if we do little of planing then this can be done in jiffy like keep the potatoes to boil while you making morning tea or coffee or even boil potato previous night to save time in morning. 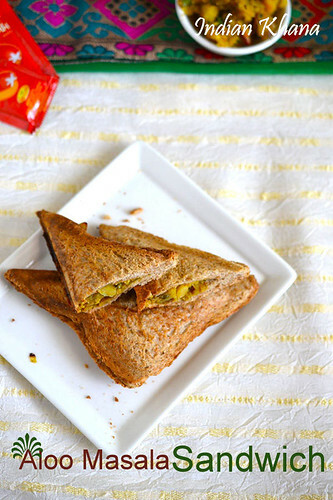 This aloo masala grilled sandwich is famous with kids they love it and also works good for lunch or tiffin box, breakfast or snack or even dinner it's works great with multiple ways. For kids you can also add little grated cheese or a cheese slice while grilling bread to please them further. 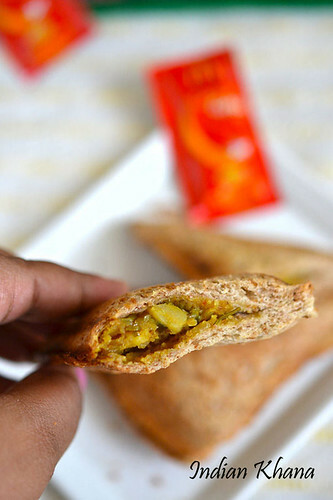 Try this sandwich and you will love it too. Grilled sandwich with wholemeal bread and spiced mashed potato. Pressure cook or boil potato for 3 whistles or until done, peel and mash potato well. While potato getting cooked, peel and finely chop onion, green chilies, coriander leaves. In a pan or wok heat oil add mustard, cumin seeds and allow to splutter. Add onion, green chili and saute until onion become soft and light brown. Now add turmeric powder, red chili powder, garam masala powder, salt mix well. Add mashed potato and mix well, cook for 2-3 minutes in medium flame, add coriander leaves mix well, off flame and allow masala to cool. Apply butter on a side of bread, now apply thick layer of potato masala on same side and level stuffing, cover it with another bread. Apply butter on bread side facing towards the grill and repeat same for rest of bread pieces and heat a toaster or griller. Place two sandwich on toaster and toast until bread becomes brown and crispy or as you like your sandwich to be, repeat same for another batch. Serve warm with ketchup, sauce or green chutney. You can also place thin slice of tomato, onion along with potato stuffing before grilling sandwich. You can apply layer of green chutney or sauce before apply potato masala. You can skip butter if you wish totally. You can do the same on a hot tawa or pan too just handle carefully and press gently bread while roasting. 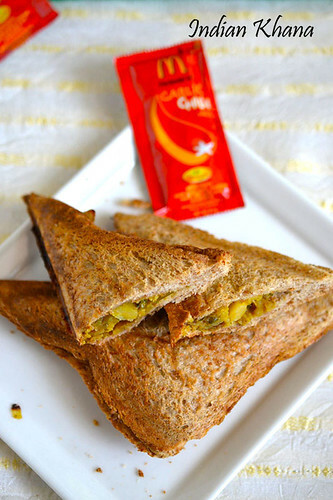 You can add cheese to make cheese aloo masala sandwich. 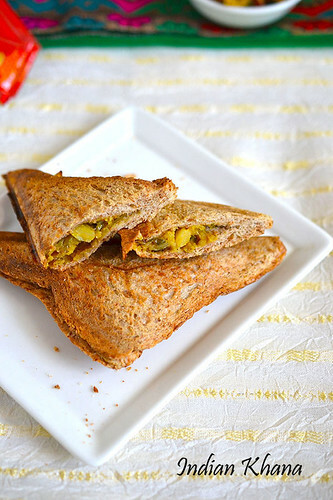 Delicious and filling potato grilled sandwich.